HCL (Hertfordshire catering Ltd), which provides catering in most of Hertfordshire’s schools, has won a national award for excellence. HCL won the Local Authority Caterer of the Year award at the EDU Catering Excellence Awards gala award dinner on 10 October. 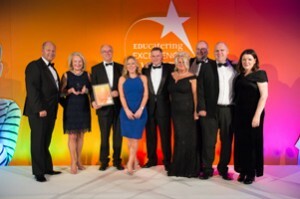 The EDU Catering Excellence Awards recognise the stars of school meals – outstanding individuals and teams who have excelled within the school meals sector. HCL’s award winning submission focused on its substantial successes in the last year, which included an increase in turnover of 5% to £36m and securing 18 NEW contracts to deliver services over the next 3 and 5 years. HCL has driven increases in the number of meals being served in primary schools in the last year and students in secondary schools are spending more on the healthy food HCL provides on-site – the average spend per student has risen by 13.2% in the last year alone!. HCL provides catering for 94% of all schools in Hertfordshire and last year served more than 15 million meals. The submission also demonstrated how the company has thrived since it branched out from Hertfordshire County Council by becoming a limited company in 2013. The council retains 100% of the shareholding and this year HCL will be returning a dividend to the council as shareholder, making an important contribution to the council’s funding of vital front line public services in Hertfordshire.